I love hydrangeas. Blue hydrangeas in particular. It wasn’t until a year ago that I learned that blue hydrangeas are not actually blue flowers, they are white flowers grown in acidic soil. Acid soil= blue flowers. Alkaline soil= pink flowers. Normal soil = white or pale green flowers. Don’t ever say I never learned you nothin’. * Note about Easter eggs: What, you don’t keep plastic eggs laying around the house all year? If you don’t want to buy them online, you can substitute the egg for the top of a plastic water bottle or paper cup trimmed to size. It need not be perfectly round, just a general dome shape is fine. 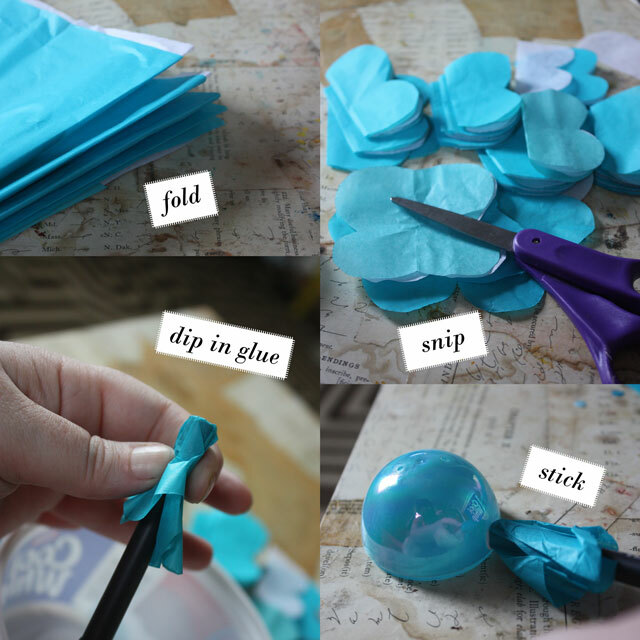 **Note about glue: You need a thick and hefty white glue for this project. I am especially fond Aleene’s Tacky Glue. Regular white glue will stick but it will slide all over the place (molto frustrato!). 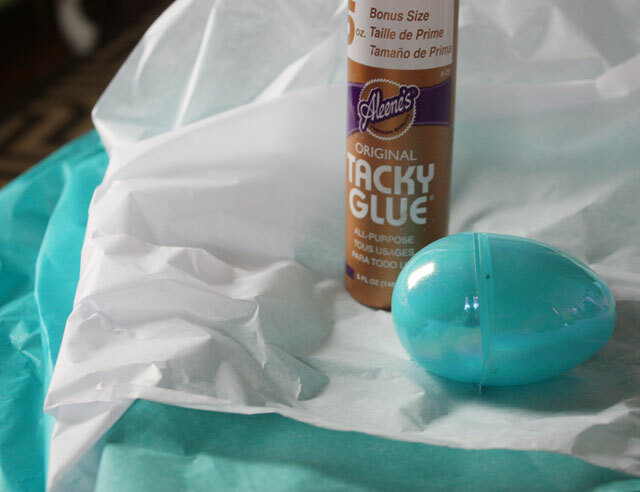 Hot glue will also probably work, but exposing the plastic egg to intense heat will let off toxic gas. So, you know. There is that. Assembly is very easy (read: munchkin friendly). Accordian fold tissue paper with 1″ pleats. Cut “B” shapes along the fold, creating stacks of four-point blossoms (you will need at least 15 blossoms per hydrangea, more if you want it big and full). 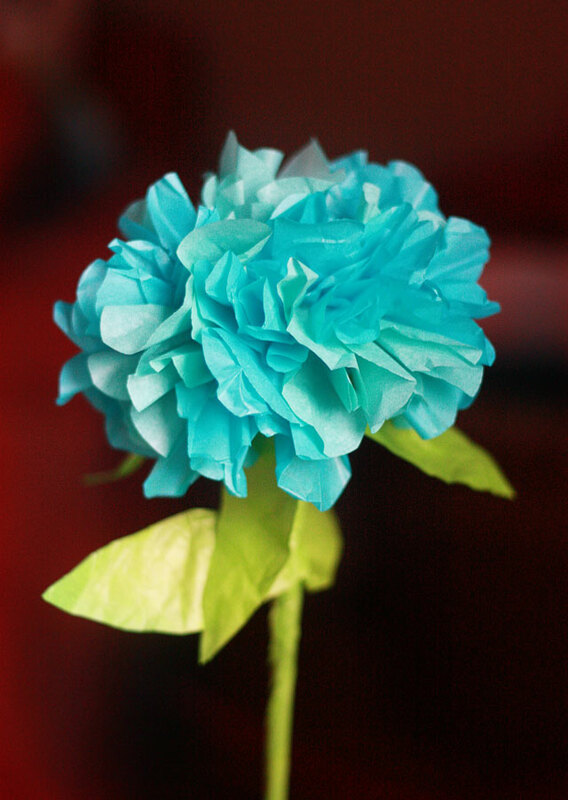 Individually wrap a blossom around the tip of a pen or pencil and dip into a blob of glue. Stick it to the egg, working from the outside perimeter toward the center. 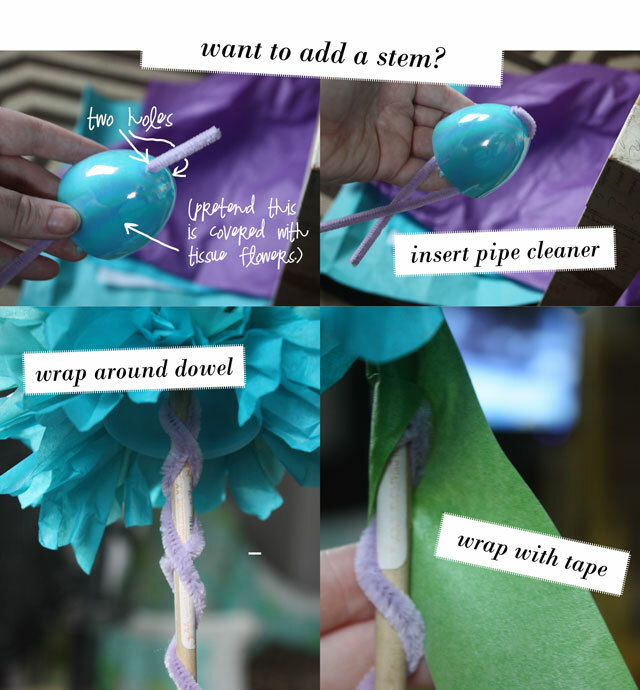 This part is a little hard to explain without an in-person demonstration, so I’m hope you get the bottom line: use a pipe cleaner to loop through the holes in the ends of the egg, then use the remaining pipe cleaner lengths to attach the flower to whatever you like. I used a wooden dowel rod here, but I’m probably going to rip it off and stick it on a headband as a facinator (The Derby is tomorrow, after all), or slip it on to a package, or the handle of a basket, etc.. Most plastic eggs come with two holes on each end, so this part should be pretty easy. If you don’t like seeing the hollow bottom of the egg, use your tape to attach some green leaves to the inside perimeter. In the family…*Need a vase to hold your hydrangeas? They would look fabulous in Suzonne’s decoupage lace vessels. *Want to make this a little more Eastery? 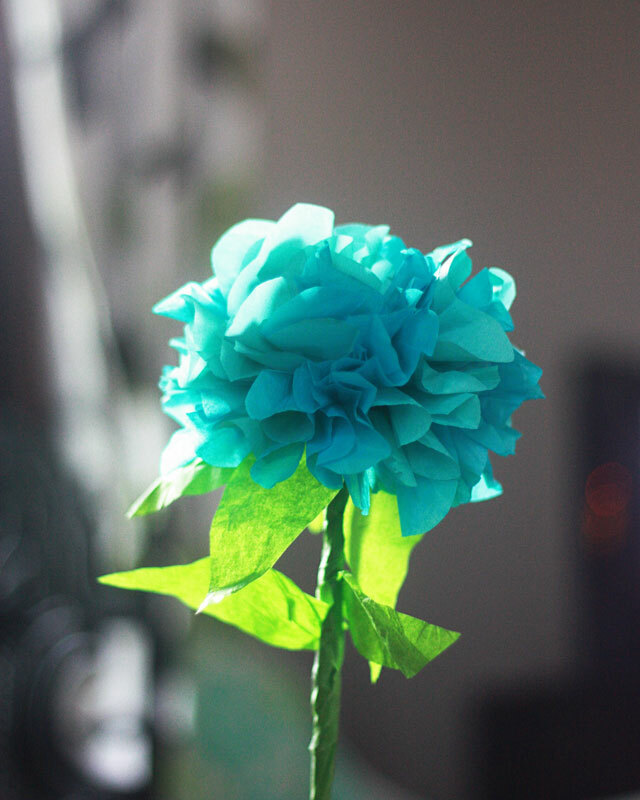 Check out the blue flower egg at Simply Designing that inspired this project in the first place. *Want to manipulate hydrangea color in your garden? Click here to learn more. How clever you are with that Easter egg! I’m totally using that idea. And thanks for the link to my decoupage lace containers – I do believe it’s a match made in heaven. So gorgeous! I’m definitely making these! I love Hydrangeas too. But living in a condo prevents me from having it. This is way too cute. I will try this one. Only problem is I don’t have a plastic Easter egg. Also available at the $1 store, Styrofoam balls you can cut in half. I don’t believe you have to worry about hot glue vapors with the Styrofoam. Plastic easter eggs are at all the dollar stores in Canada now. Hydrangeas are my absolute favorite flower! Thanks so much for the great tutorial! I want to try these hydrangeas. I’m guessing the squares of tissue need to be at least 4 inches? Depends on the size flower, but I think these were around 3″…4″ would work fine so long as the egg was pretty large.